It wouldn’t be a summer in New York City without Shakespeare in the Park. 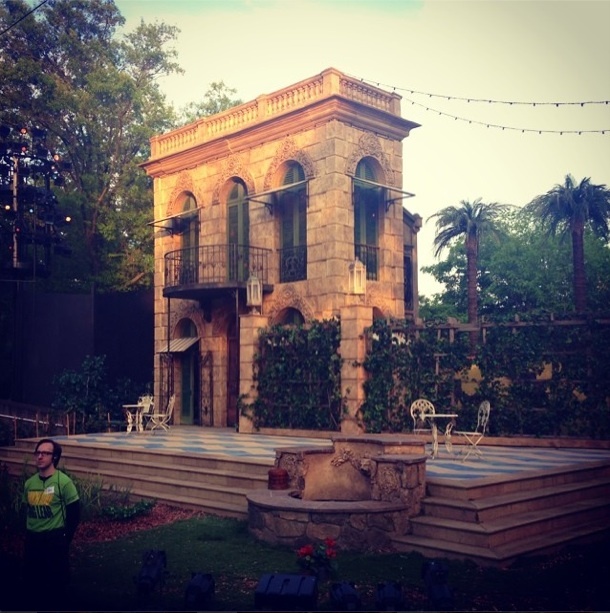 This year for its 52nd season of performances in Central Park’s beautiful Delacorte Theater, Much Ado About Nothing was the ‘to see’ event. From the elaborate costumes to the notable performers there was never a dull moment in this production- especially in the 2nd half. Just as New York must have Shakespeare, Shakespeare must have drama. And though “Much Ado About Nothing” is a romantic comedy, there was a lot of drama. We were curious to see how all of these scenes are put together, and with an invitation to go backstage Behind the Scenes, our editor Brigitte got to see first hand how the crew can make the visuals and props look so realistic. Turns out, the costumes are wash friendly nowadays, and are cleaned every day which never used to be done. Thanks to Tide as a main sponsor of Shakespeare in the park, we got to find out how all of the dirt, fake blood, paint and sweat is easily washed away. Though there wasn’t much blood in this particular play, we learned about how to make fake blood using chocolate syrup of all things. Then, we got some helpful tips on how they get these stains out. You can only imagine the stains syrup would leave, especially with such delicate (and ribboned) costumes! as a pre-treatmenent for major stains, use a mixture of Tide and water to apply directly to the stain. Once it is applied, use a scraper to gently release the built up stains. (A sponge is always a good tool.) To test out how this will react on the fabric, put the mixture on a spot on the inside seam allowance or hem. This is great for tough stains. Another tip we got behind the scenes, is for “BO” i.e. body odor scent, spray a mix of (vodka) and water to refresh without any damage to the garment. The classic romantic comedy will be showing all throughout the summer at this venue. Tickets are free but definitely in high demand. You can either enter a virtual lottery, get tickets at the park, or reserve a seat and skip the line with supporting Free Shakespeare. Hamish Linklater and Tony nominee Lily Rabe who perform as would-be lovers (that apparently are now a real life couple) Benedick and Beatrice are a fantastic duo in the Park. They are directed by three-time Tony winner Jack O’Brien. For the show Central Park is wonderfully transformed into a summertime Sicily, and with an outdoor theater you’ll feel like you are actually there. BTS: SHAKESPEARE in the PARK‘s “Much Ado About Nothing” commentary by Brigitte Segura, written by Bianca Scherrei. black and white photo by courtesy (fdmLOVES edit).